The ERI-TB core group pictured during a meeting in 2016. The ERI-TB aims to strengthen the use of TB evidence, information and research for health care policy makers in Europe. The Conference focuses on 8 thematic tracks, one of which is scientific research and innovation. Pursuing research, science and innovation is also one of the major commitments and calls to action outlined in the Moscow Declaration to End TB, adopted by Member States during the Conference. TB research is a key area of intervention to end the TB epidemic – it is one of the 3 pillars of both the End TB Strategy and the Tuberculosis action plan for the WHO European Region 2016–2020. WHO/Europe established the European Tuberculosis Research Initiative (ERI-TB) in 2016 to advance TB-related research in the Region and to serve as a regional platform to support the implementation of the TB action plan. In November, ERI-TB launched a one-month public consultation as part of an ongoing effort to define research priorities and identify research gaps in the Region. The public consultation seeks input from national counterparts, regional partners and other stakeholders, with the objective of identifying and setting priorities that underscore basic TB science and operational research. operational aspects of intersectoral cooperation. Thanks to the contributions and efforts of the expert Core Group members, a final list of 76 research questions was produced. An online platform is being used to systematically collect responses to these questions, and the consultation will provide an objective measure of the relevance and urgency of the suggested research. The final outcome from this consultation will be a ranked and prioritized list of research questions, sorted into highest-, high- and medium-priority categories. 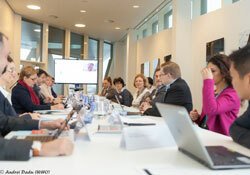 WHO/Europe will use the results to develop regional policies in the area of TB research.